Focus on 200L-20000L large blow molding machines. 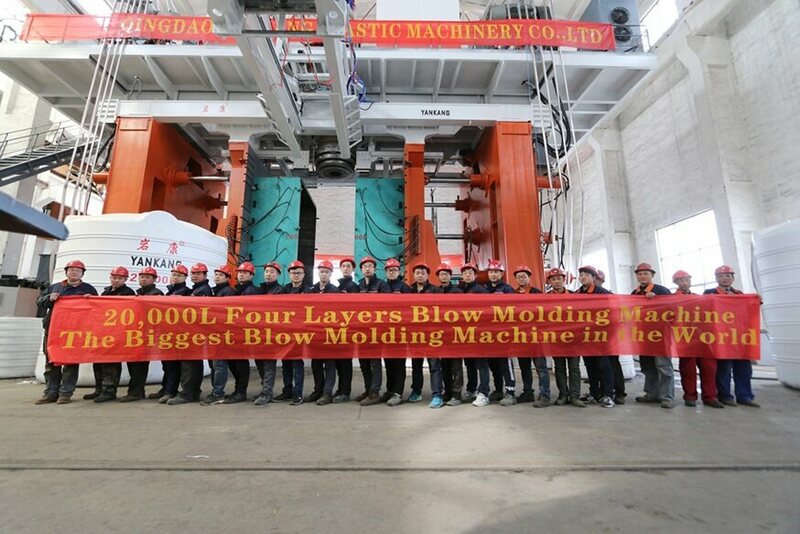 20000L super-large water tank blow molding machine is the largest and most advanced blow molding machine in the world and can be used to produce water tank from 1000L to 20000L in 1-6 layers. 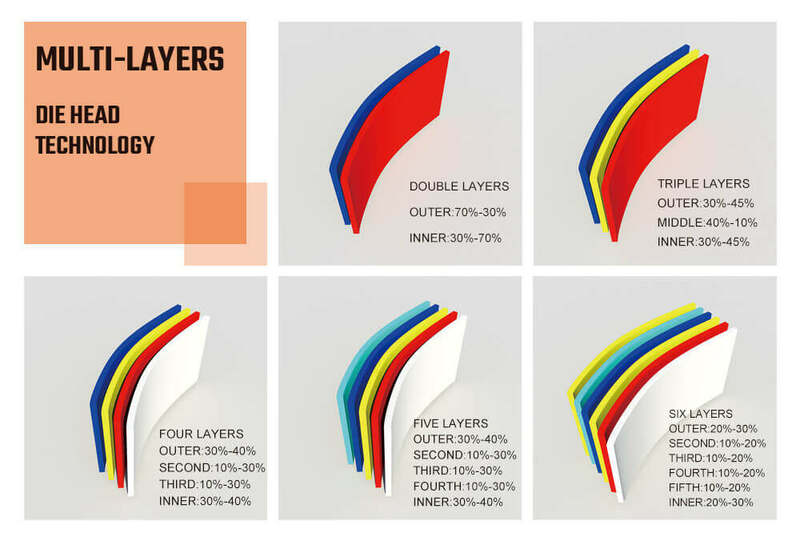 1.FOAM LAYER ：Foam layer as a new innovation which can increase the wall thickness. 2.INDUCTION HEATERS：Induction heaters for die head and extruder can save 40-50% energy. 3.SERVO MOTOR：Servo motor for clamping system which can save 40% energy. 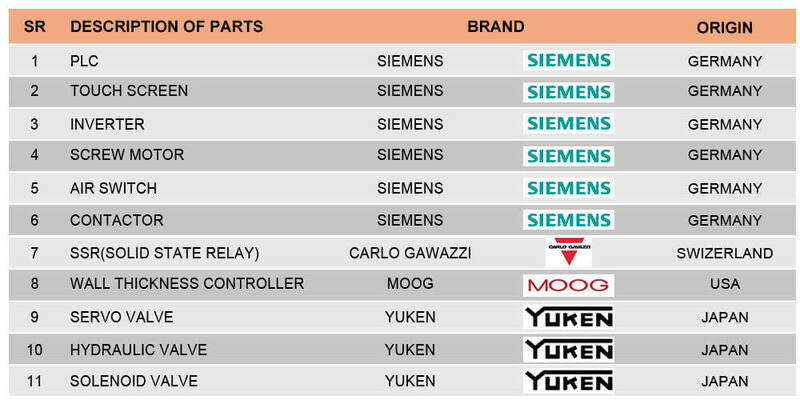 4.REMOTE SERVICE：Easier to check machine running conditions, cycle times, output,reminding for machine maintenance. Real-time monitoring is convenient for supplier to check the machine faulty and judge the machine problems. With the servo-hydraulic system, energy saving is more than 40%. The latest temperature control system ensures the adaptation to the global climate. For more advanced configurations, please refer to the following figure. 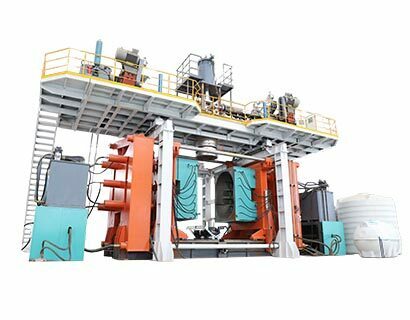 20000L super-large water tank blow molding machine can use 1000L,1500L,2000L,3000L,5000L,10000L and 20000L blow molds. Can be used for production:1000L tank 10-12 PC/H,1500L tank 9-12 PC/H,2000L tank 8-9 PC/H,3000L tank 5-6 PC/H,5000L tank -34 PC/H,10000L tank 1.5 pc/h and 20000L tank 1 PC/H. 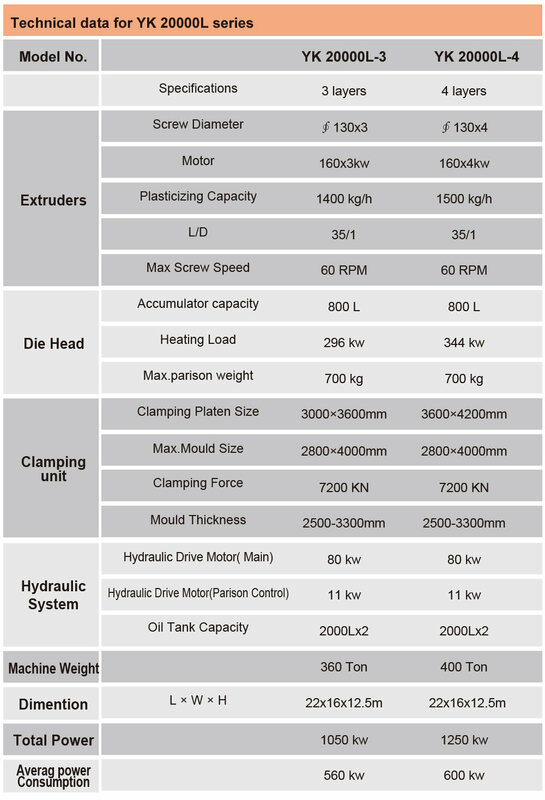 In the table below, the data of the blow molding machine of YK 20000L-3 layers,YK 20000L-4 layers are listed. For more models of 20000L blow molding machines, please contact us. 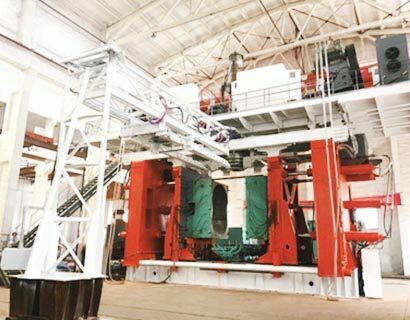 The 20000L super-large water tank blow molding machine can be used to produce water tank from 1000L to 20000L in 1-6 layers. The seller could dispatch an engineer against the requests of the buyer to install and adjust the machines for one week(free of charge) in the buyer’s factory. After one week,if the buyer still needs the training,$100 should be paid for the engineer. The buyer should pay for the engineer’s food & board while installation in buyer’s factory.And the buyer should also pay for the air ticket for the engineer. 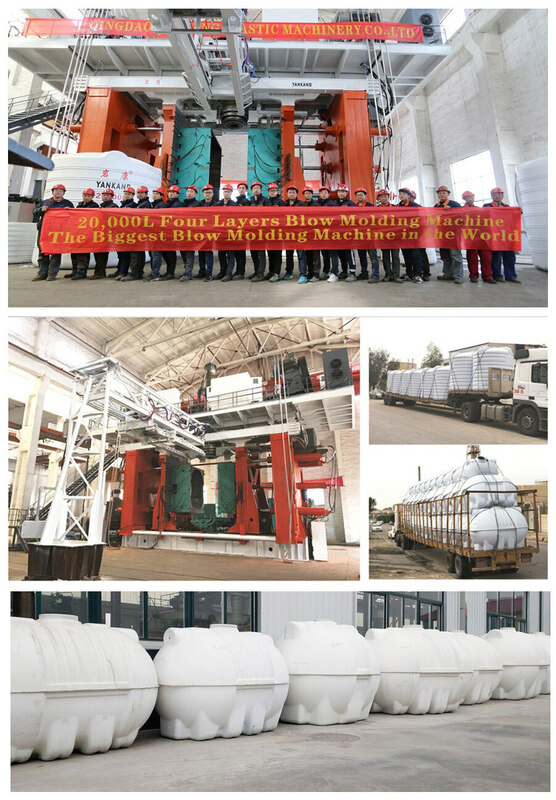 Qingdao Yankang Plastic Machinery Co.,Ltd is the biggest leading manufacturer of blow molding machines in China, which is specialized in manufacturing, designing in super size blow molding machines and blow moulds with capacity from 200L upto 20,000L for 1-6 layers productions. Qingdao Yankang Plastic Machinery Co.,Ltd. All Rights Reserved.